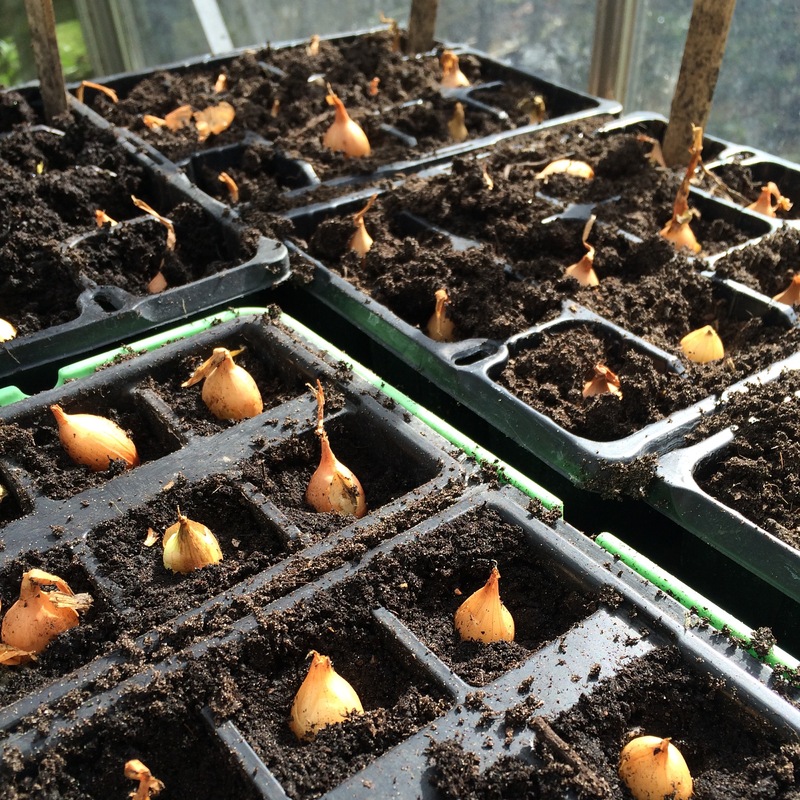 I’ve finally starting my growing season… in more ways than one! Bump is steadily increasing week on week, and I’m now feeling the baby kick more and more. It’s a strange, fluttering, bubbly feeling that I absolutely adore. We’re officially half way through now! The days are getting longer again and I’ve finally found the motivation to get on with growing. 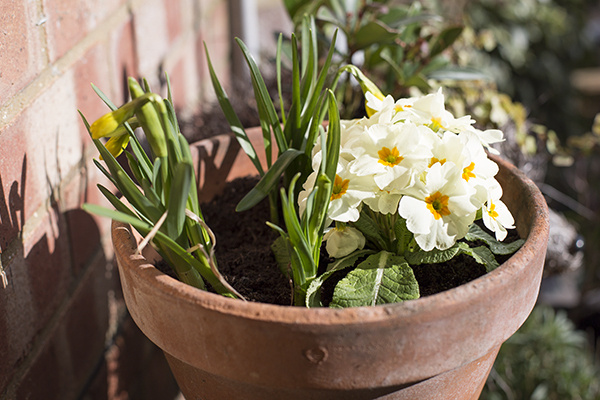 The daffodils are out in force and the tulips that I planted in the borders are starting to show through. I’m sure in no time it’ll feel like the accelerator is on and everything will just explode, but we’re not quite there yet. So I am trying my best to catch up on my extended winter hiatus and get ready for a summer of the Good Life. Rich has started to put in the polytunnel base plates so hopefully by the end of spring we’ll have a functioning polytunnel to grow in too. Meanwhile, I’ve been pottering around trying not to do too much too often (frustrating), but I’ve managed to sow some carrots under cover, got some peas and calabrese waiting to go into the ground, and some onion and shallot sets just taking root in modules in the greenhouse. I’ve already sowed some cosmos and mina lobata, and I’m hoping by the end of the week to have some sweet peas potted up. I see the social feeds of other grow your own aficiandos and I feel so behind… but gone are the days of beating myself up about it and really, now, it’s just motivation to do more! Lastly, I’ve also got a couple of gooseberry bushes to find some space for. I opted for hinnonmaki red as I fancied the idea of tucking into the sweeter, blushed pink fruits later in the season. Of course I’m not expecting a heavy yield, but it’s just a good feeling to be expanding my growing repertoire. 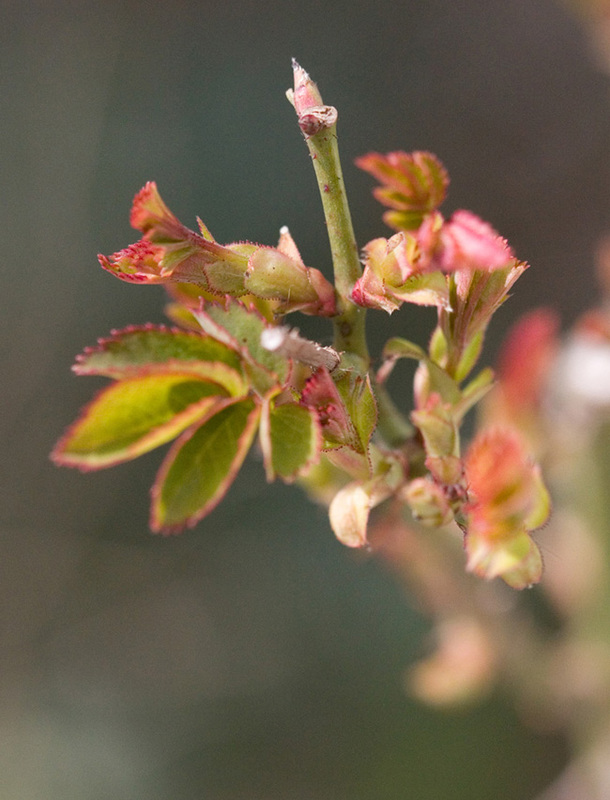 And any extra blossom and flowers ahead of fruit in the garden is good by me – something else for the pollinators to feast on! 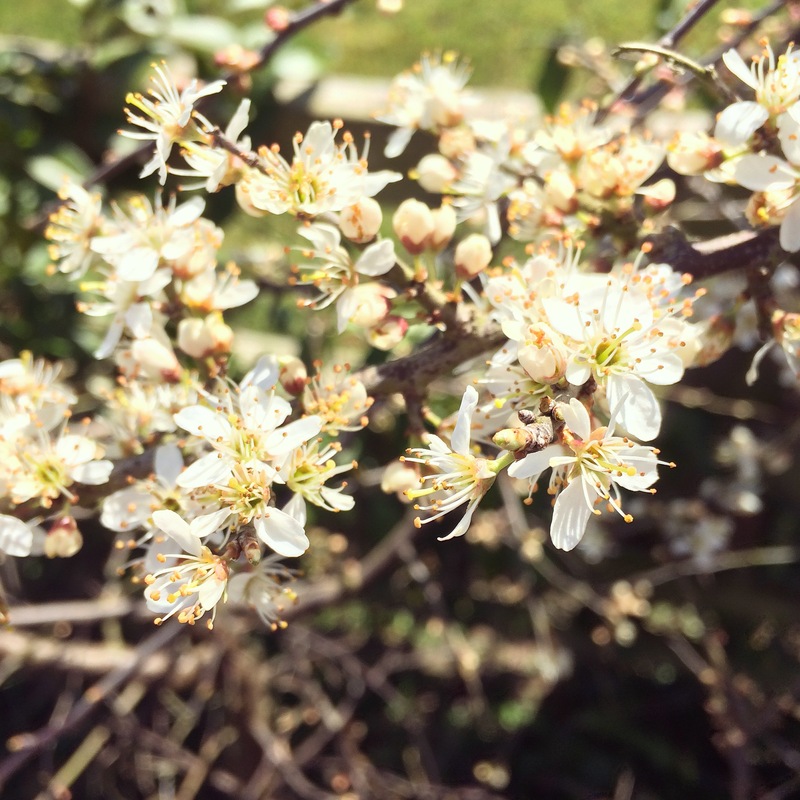 The sloe blossom (blackthorn bush – see top pic) is already out despite the chilly temperatures, and the bees are loving it. Can’t ask for more. Ah, spring. What a temptress… one minute, it’s all bright sunshine, blue skies and a burst of colour, the next it’s grey-clouded drudgery, and north-easterly arctic winds blowing a gale through your house. I have just come to the end of a week off work, and for the most part the weather was crap. So as always I didn’t get out nearly as much as needed, and didn’t get as many jobs done as I wanted to. 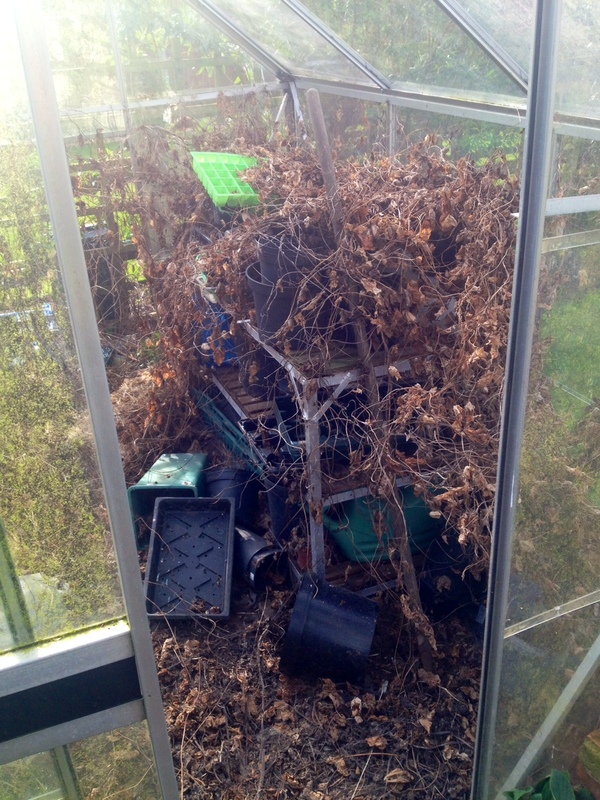 Greenhouse cleaning is one of those jobs (like digging) that I really really really don’t like doing. But I couldn’t take it anymore. It just had to be done. So I spent four hours clearing out dead bindweed, removing the old straw bale (fab compost material) that I’d previously grown squashes on, and dug up two barrow loads of bindweed roots, all just to find some semblance of restored order. 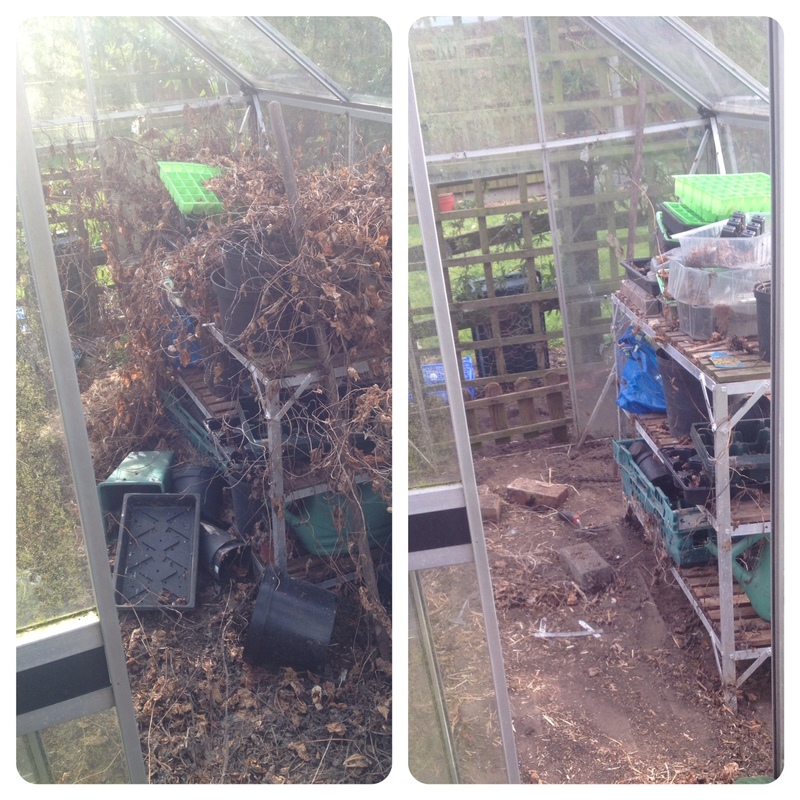 As you can see from the pictures below, my greenhouse fell victim to a storm about a year ago, where we lost a number of glass panels. Those will have to be replaced at some point but for now we’re just enjoying some “ventilation”. The greenhouse is in a pretty sheltered corner, so there’s still a decent amount of heat and protection from frost in there. Typically, it’s still a half-finished job, but at least it’s looking a little less neglected. Around the outside, I’ll also be chipping our pruned apple tree branches to make homemade mulch which will be going over some weed suppressing mat, and then there’s the even more brain-numbingly boring job of cleaning pots and trays before I even put the greenhouse into action. But once it’s done, it’s done and I should be able to reap the rewards. It’ll be a thing of beauty, a corner of my Smallest Smallholding that I’ll be proud to photograph in all its glory. The sun came out for the first time in what feels like an aeon. The last time it properly showed its face, I was in the office and effectively missed it. 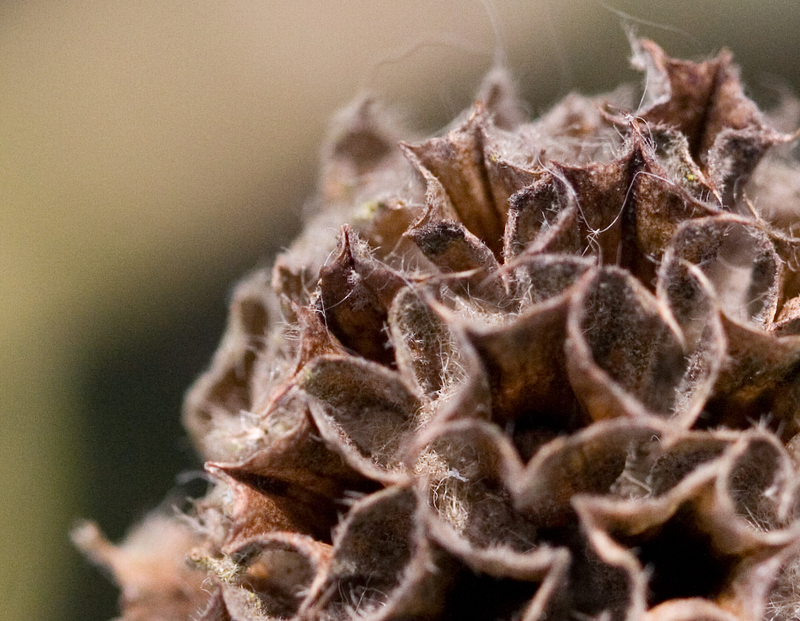 It seems though that we’ve finally got over that hump, and we’re well on our way to Spring. I can’t tell you how much happier it’s all making me feel. I’m still not sure about whether I can kick start the growing properly; temperatures are down overnight, and I’m still having to break the ice in the bird baths in the morning, so I think the soil needs a good fortnight to start warming up properly before I start sowing directly. 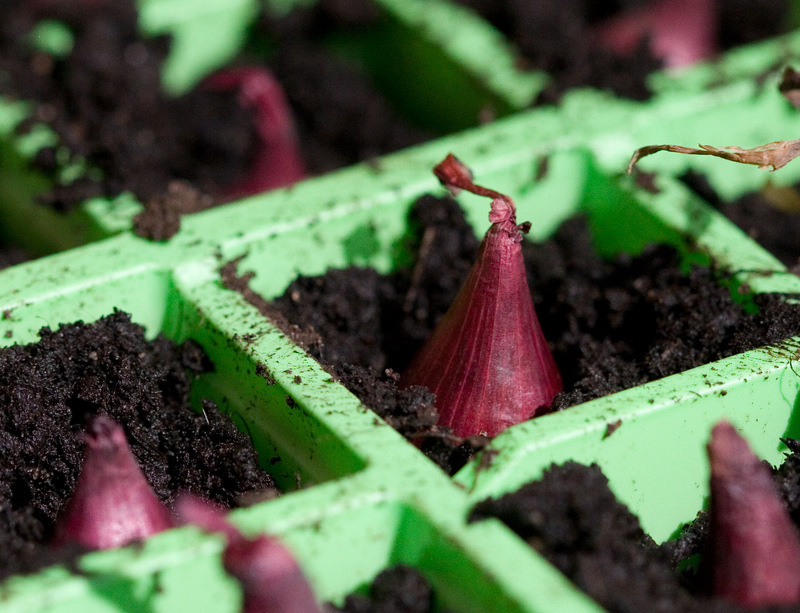 Having watched Gardener’s World on Friday night, I took Monty’s advice and instead of playing a waiting game and risking losing any more of my onion sets, I decided to plant them into seed modules with compost, and let them begin rooting. I shoved the garlic in too, for good measure. Until we get some mini polytunnels set up, I’m not playing poke-the-garlic-in-pull-it-out-again with the woodpigeons. I bought the Red Baron onion sets from my local Gardener’s Association back at the beginning of March (or was it late February? ), but they’ve had to stay put in their paper bags. This means many of the sets have gone soft and are useless, but I managed to “sow” about 70% of them. There were a few which were on the verge, but I always seem to be championing the underdog, so I thought I’d at least give them a chance. I also found a bag of alliums that I’d bought at the beginning of March too. I think at that point I was desperate to just buy something that would make me feel as though spring was upon us. 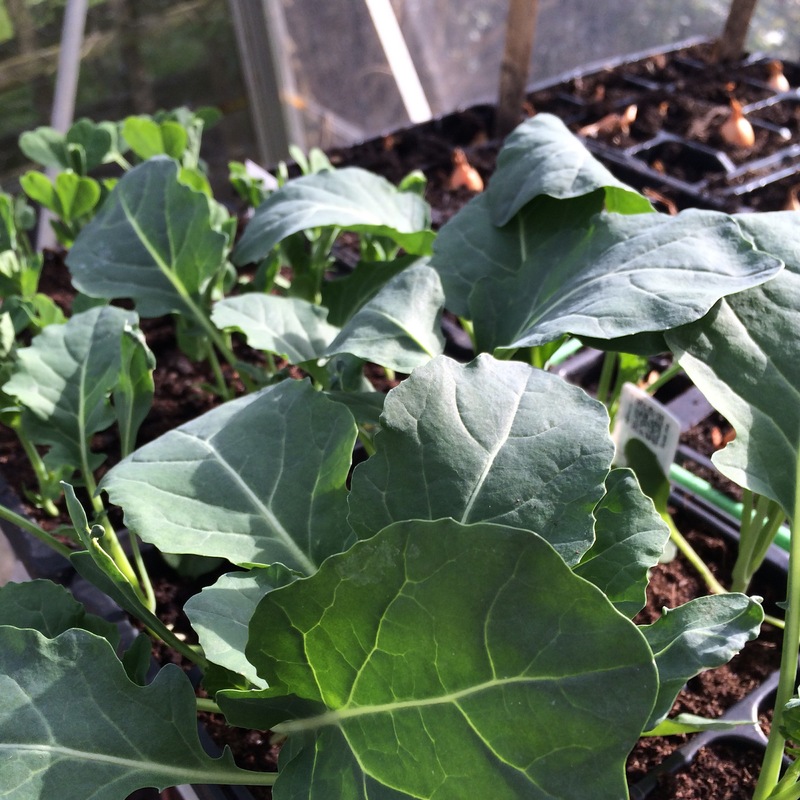 But these little guys had already begun to sprout, so I popped them in the seed trays too until I’ve prepared the patch where they’re going to planted. To be honest, I don’t think the alliums need much – they prefer well-draining soil, and will even thrive in poor soil, but I think ours is virtually sand in some places and I wonder whether it’d be pushing it to expect them to do anything there. I have a couple of Purple Sensation alliums to go in too – can’t wait to see them flower and the bees and pollinators to come knocking. So although I’ve been sowing in earnest, there’s still not a lot to show. Spring is more than fashionably late this year (we only did our first little bit of mowing yesterday), but it doesn’t mean that I can rest on my laurels. There is just so much to do – clearing, weeding, soil preparation, ripping up brambles and bindweed. Every year it’s like starting from scratch, but this year, it’s all about progress. I’m more determined than ever to make it work – even if that means just turning one corner into my self-sufficient, wildlife-friendly Smallest Smallholding vision – and for now I’m just sowing the seeds of what I hope will be a successful season of sowing, growing and mowing.